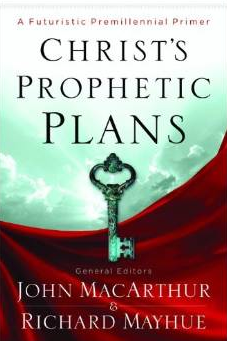 No one today has been a greater champion of dispensational (called“futuristic” in the book) premillennialism than John MacArthur. He is also the best example today of one who has preached expositionally through all of the New Testament. Is this a coincidence? Those who agree with his eschatology say no. Let me try to summarize the book in five points. If you and I were drinking coffee together and you asked me what is so convincing about futuristic premillennialism, I’d give five marks that encapsulate the core of this book. First is Revelation 20:1-4. The fivefold action (seizing, binding, throwing, shutting, and sealing) of the angel toward Satan in order to forbid him from deceiving the nations has not yet happened, for presently he is the god (Rev. 9:1-3), ruler (1 Jn. 4:4), and lion (1 Pt. 5:8) of this world who snatches away the gospel (Mk. 5:15). The timing of this cannot be at the cross, for whatever was done in v. 2 will be undone in v. 7. John’s usage of “thousand” is literal, as are most of the numbers in Revelation and is happy to use generic terms for time elsewhere (20:2,8). The premill position does not recapitulate but moves chronologically right through the 2nd Coming in Revelation 19. Second is the nature of election. All agree that the election of angels, Christ, and the church was divine, irrevocable and unconditional. So why is the election Israel not given the same definition? Third is the nature of Israel. “Israel” is found over two thousand times in Scripture, 77x’s in the NT and always refers to “ethnic” Israel. The only two passages up for debate are Romans 9:6 and Gal. 6:16. At the outset, then, the burden of proof is upon those who define Israel differently. The context of these two passages makes “Israel” to refer to Christian ethnic Jews. The Bible teaches, then, that salvation and restoration of the nation of Israel will be a means of blessing. There is one people of God in the sense that there is salvific unity among all believers through Christ. But this doesn’t mean there is no distinction within that one people (like Israel and the church). Fourth is church history. Essentially all the church fathers were premill. It began to wane with the rise of Augustine, allegorical hermeneutics and Platonic dualism. Fifth is the New Testament view of the kingdom and the pre-trib rapture. The disciples still saw the kingdom as literal (Mt. 20:21; Acts 1:6). Jesus promised thrones (Matt. 19:28; Lk. 22:28). Paul too (Rom. 11:1, 25-28). Regarding the harpazō, 1Thessalonians and 1 Cor. 15:51-52 refer to the same event but not the same as Matt. 24-25. The church is not mentioned in Rev. 6-19 and John 14:1-3 parallels 1Thess. 4:13-18. This entry was posted in Book Reviews and tagged 2015 Review, systematic by Paul Schlehlein. Bookmark the permalink. Four of the observations are strong, but can we be so confident with #3? If we admit any of these three examples refer to the church, then we have given the church one or more of Israel’s names. If it takes one name, there’s no logical reason to hold back another name. And just because 70+ times Israel refers to an ethnic group: Elohim usually refers to Jehovah, but sometimes to false gods. Sheol usually refers to the grave, but sometimes to the final state of the damned. The burden of proof may be on those who want to allegorize “Israel,” but since they already have a few other clear examples where the majority of the usages changes, then the burden is not as heavy to lift as this particular point implies.